It was 1960, I was 11 years old and mad keen on Western Welsh buses. One day my friend asked if I had seen the new double-decker Leyland Atlantean, with the engine at the back – I hadn’t and I was madly jealous, I was the bus enthusiast, why had he seen one and not me! This caused a new pattern in my habits, from now on I would have to walk home from Oldcastle School via Cowbridge Road instead of Ewenny Road (we lived in Priory Road in those days) just in case an Atlantean from Cardiff should pass by. “You’re late getting in for dinner today” my mother would enquire. “Oh, I came Cowbridge Road way for a change” it was actually a much longer way home and left me very little time for lunch before nipping off to school again for the afternoon. It was February, a wet school day with the rain pouring down and I was sent off to school in my Robert Hirst raincoat with the collar up and buttoned tightly round my neck topped off with my school cap, an outfit which kept me mainly dry, except for the bit where the coat ended and your wellington boots began and I was beginning to feel uncomfortable as the cold rain trickled off the bottom of my coat, down my legs and into the top of my boots. Already my knee-length socks had slipped down to my ankles and the now-damp linings inside my boots felt clammy as they flapped against my bare legs at every step. I think the dictionary definition of clammy describes perfectly how the inside of my Dunlop wellingtons felt that morning, they were “Disagreeably moist, sticky, and cold to the touch”. As I trudged miserably down Ewenny Road even the sight of a regular service bus passing didn’t lift my spirits, it was a Tiger Cub, probably of the LKG or MUH series dating from 1957 which usually ran the coastal routes; one of the school buses chugged wearily by, it was a half-cab of the DKG series introduced in 1949, still in service for schools and work contracts but withdrawn from most passenger services by this time. The school bus made a left turn into St Marie Street but I didn’t, I walked the extra few yards to use the South Street entrance and then, I really couldn’t believe my eyes, coming down Cowbridge Road was a Western Welsh bus, the likes of which I had never seen before! I forgot all about the rain and how miserable I felt, here in front of me was the one thing that I wanted to see and it fulfilled every expectation, it was flippin’ gorgeous. I skipped into school with a great big grin on my face! The photo shown here is from my large collection of bus pictures which I have accumulated over the years. I should like to have shown one taken in Bridgend Bus Station but you’ll have to make do with this one at Cardiff as it best illustrates the TUH series vehicle I saw on that day in 1960. Some readers may think they have read this story before, well, you’d be correct in that assumption as I have published it previously on flickr, but I have updated the tale with information now freely available in Colin Scott’s excellent book, Red, Cream and a touch of Gray, The Western Welsh Story. Did Western Welsh ever paint there buses in a crimson lake colour? I have just got a model by Corgi Original Omnibus, Leyland PS1, Western Welsh Omnibus Company. No route number, but blind reads MERTHYR MAWR RD, EWENNY ROAD. You mention this route from your boyhood. This poor bus, has lost it’s nearside headlamp, and spotlight though! In the Corgi item list, No.40601, comes up as red, and cream, not crimson lake, and cream? Perhaps this Leyland PS1, is in the wrong box perhaps? Red and cream would have been the colour, and Merthyr Mawr Road was certainly a route that buses of that type traversed. Strange to have that as a destination however, as the route was PRIORY AVENUE via Merthyr Mawr Road, well in my boyhood days it was, maybe before the 50s there was a route just to MM Road, who knows! My 1958 timetable shows there were 27 services per day on this route of about two miles. I WORKED AT ELY GARAGE FROM 1969 TO 1974. WHAT WAS THAT SORT OF PALE RED THE BUSES WERE USUALLY PAINTED. OFTEN WONDERED. 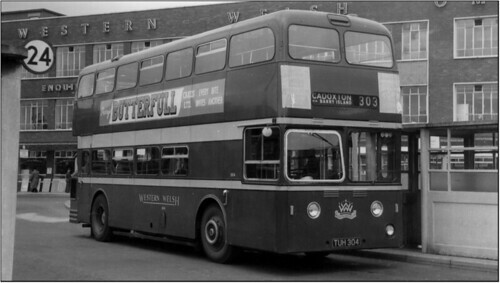 AS AN EX-FITTER AT W.W. ELY WE FOUND CERTAIN PROBLEMS WITH THE ATLANTEAN, ONE OF WHICH WAS THE ENGINE OFTEN FELL OFF AND LAY, STILL RUNNING, ON THE ROAD. PARTICULARLY AS AT BARRY DOCK WHEN AN ATLANTEAN WAS HIT BY A TRAIN, AROUND 1971. THE FIRE BRIGADE COULDNT STOP THE ENGINE AND HAD TO CALL US FOR HELP. AND QUITE SURPRISINGLY THE MOST COMMON CAUSE OF ENGINE FAILURE WAS AN ENGINE BEING ALLOWED TO RUN OUT OF OIL, THAT KEPT US BUSY THOUGH, I SUPPOSE. THE NUMBER OF BUSES BEING DRIVEN UNDER LOW BRIDGES. AND LOSING PART OF THEIR. ROOVES WAS ALARMING,BUT THEY USUALLY HAD NO PASSENGERS ABOARD, THE DRIVER DECIDING TO LEAVE THE ROUTE BECAUSE HE KNEW A QUICKER WAY HOME WITH AN EMPTY BUS. BUT IN MY MEMORY ELY DEPOT WAS A PRETTY GOOD PLACE TO WORK. STAN WAS THE FOREMAN AND A VERY NICE MAN. AND IS A PARTICULARLY GOOD MECHANIC, ALAN COTTERAL OF PENARTH STILL OUT THERE I WONDER.